Towards Yokohama special self-government city! 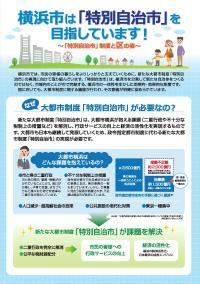 What is special self-government city which Yokohama-shi aims at? In big city, we will have correspondence to population decline and low birthrate and aging, many serious problems including maintenance update of city infrastructure becoming obsolete in future. On the other hand, we fight successfully through competition between cities with overseas big city, and, in big city, role to pull economic growth of the whole country is expected. We review current designated city system to play a role as big city in correspondence with such a problem and are system that big city carries all district office work except office work that country should carry on unitarily. Based on "Yokohama special self-government City University rope draft (the main point)," we collected basic thought of "special self-government city" where Yokohama-shi aimed at realization after discussion with City Counsil based on interim reports of subcommittee specialized in the 30th Local Government System Research Council. Based on "basic way of thinking of the new big city system foundation" << basic directionality >>, we gathered based on discussion in City Counsil, proposal of Yokohama City Univ. city self-government society. We devised based on proposal of the outside well-informed person and discussion in City Counsil so that we reviewed current designated city system that provisional measures continued for more than half a century radically, and big city contributed to development of the whole country. We explain using concrete example clearly how living changes why whether the foundation of special self-government city is necessary.